Nina Danino has followed certain themes in her films such as the theme of sacred space (The Silence is Baroque, Communion, Temenos), the development of territories devoted to female visionary figures (Stabat Mater, “Now I am yours”) and the dimension of intimate and private narrative (First Memory, Close to Home, Apparitions). 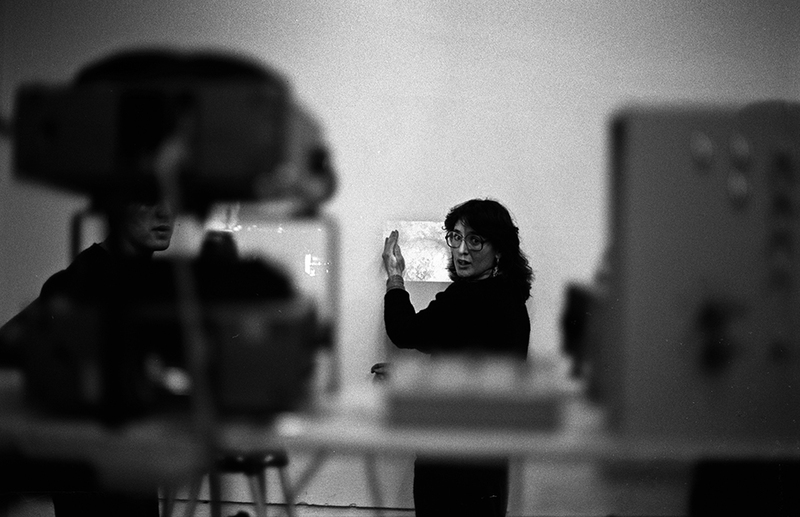 Nina Danino studied Foundation and Painting at St. Martin’s School of Art (1973-1977) and Environmental Media at the Royal College of Art (1979-1981) London, where she used slide/tape and 16mm film. She combined the subjective voice and narrative with the moving and still image as a means of enabling a feminine perspective. She made 16mm films in the ambit of the London Filmmakers’ Co-op 1981-1987. Her films 1990-1997 mix religious iconography with psychoanalysis and experimental film and vocals. The original film soundtrack to “Now I am yours” (1993) is performed by New York vocalist Shelley Hirsch and the feature film Temenos (1997) together with Sainkho Namtchylak and English soprano Catherine Bott. Terrace (2012), Gibraltar-Genoa (2013), Apparitions (2013) and Meteorologies (2013) are a cycle of works which share images and sounds about the Mediterranean dimension of climate, geography and identity set in a small region around Gibraltar and the Straits. In 2010-2016 she made a series of portraits; Communion (2010), shot on 35mm and photographed by Billy Williams BSC, Jennifer (2015) a feature-length documentary of an enclosed Carmelite nun in Ronda, Spain and Sorelle Povere di Santa Chiara (2015-16) a single-channel video, 6-channel sound installation and a silent 16mm film made with the enclosed contemplative community of Sorelle Povere in San Marino, Italy. In 2017 she completed a PhD in Film by Publication focussing on these four works titled: Experimental Film: Catholic and Feminist Readings of my films 2010-2016. Visionary Landscapes, is an illustrated volume on her work by Black Dog Publishing (2005). “..and the figtrees in the Alameda gardens” is published by Mousse Publishing (2013). Her body of work is in the collection of the British Film Institute National Film Archive. She has written on experimental film. She was a member of the editorial collective of the journal Undercut (1982-1988), she edited the Cultural Identities No 17 and is co-Editor of the Undercut Reader (2002). Her current research is in women’s experimental film and the context of the London Filmmakers’ Co-op. She convened the roundtable discussion Women of the London Filmmaker’s Co-op (MIRAJ Vol 4 1+2) 2016. Her new project is an essay film on ‘copla’ a genre of Spanish song about women’s experiences of ostracism and unrequited love. Nina Danino lives and works in London. She is Reader in Fine Art at Goldsmiths, University of London.